Hamisa Mobetto is working her way to the top of the social radar pretty fast. After winning the first phase of getting the TZ Simba to own up to his actions of fathering a child with her, she has now dragged him to court for not loving her enough and taking care of his child. Before this whole kid saga became public, Mobetto had less than one million followers on IG, but that number will soon hit 2million followers which is just half of Diamond Platnumz followers. 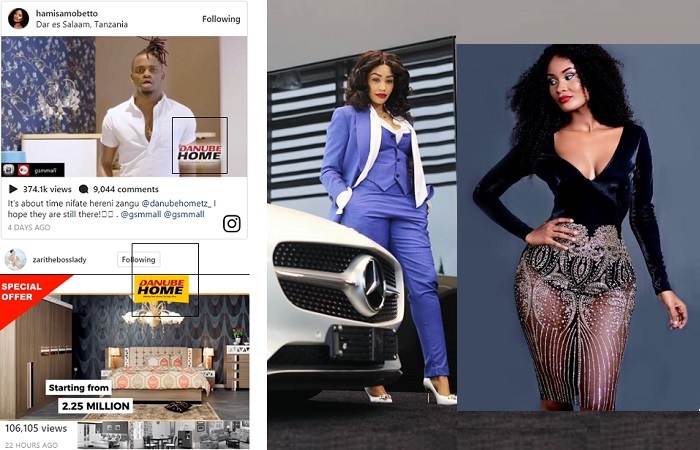 This has made companies that had earlier contracted the couple to think through their options, Hamisa is already earning some of that money by running a DANUBE home ad that featured Zari and Platnumz on her Instagram account. It was not long before Zari bounced back running another campaign for the same company a sign to show that she had succumbed to the pressure. It's because of these running contracts that the couple has to make it work between them even when things are not well. It's for that very reason that Zari says they are still together, and in this way, these contracts can be renewed which means more dimes for them. When the Hamisa Mobetto issue became public, Platnumz said that Zari was aware of it something that did not go down well with her, in fact, she threatened to take legal action. Zari did not want to drag her name into this mess as she had just signed a new contract and as it turned out, the new contract is with Mercedes Benz South Africa.